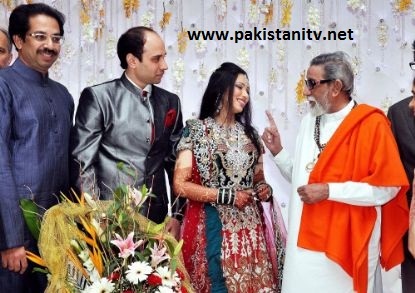 Mumbai, December 08: Shiv Sena chief Bal Thackeray’s granddaughter Neha married a Gujarati guy in Mumbai on December 4, sources said. Neha is the daughter of Bal Thackeray’s eldest son late Bindumadhav. Neha has married Manan, son of an old friend of Bindumadhav and Raj Thackeray. The marriage has further cemented the family’s bond with the MNS leader. The entire family, excluding Bal Thackeray, attended the wedding at Hotel Taj Lands End. Neha’s mother Madhavi Thackeray welcomed guests like Manohar Joshi, Ram Kadam, Ashish Shelar, Gopal Shetty, Nitin Sardesai and wife Swati, Mangesh Sangle, Shirish Parkar, Shishir Shinde and others. Raj Thackeray, too, attended the reception, along with his wife and sons, reports said. Meanwhile, there is a speculation in media circles that the Thackeray’s son-in-law converted to Hinduism sometime back, but the family has denied the reports. The Shiv Sena patriarch watched his party bite the dust yesterday in its Konkan stronghold, routed by a former Sainik. But the threat to Thackeray’s ideology seems to be coming from closer home. On Sunday, his nephew’s daughter Neha Gupte, 25, married Mohammad Nabi, 27. The wedding was kept a secret from his famous mama by Vilas Gupte. “I haven’t had the courage to tell him yet, but I’m sure Bal mama will bless the couple,” said Gupte, an anxious but proud father, at the reception. By all available reports, the bride converted to Islam and had a nikaah three months ago at Bandra (West), a posh Mumbai suburb. Thackeray lives close by, in Bandra (East), recently declared Mumbai’s dirtiest area by the municipal corporation. “They had the nikaah three months ago in Bandra, which was attended by Neha’s friends,” confirmed Mohammed Qayoom, the groom’s brother. Neha and Mohammed Nabi, both physiotherapists, met a year and a half ago at a private clinic in Kurla. They fell in love and decided to tie the knot. “But the family took some time to come around,” admitted the couple. Neha and Nabi had a registered marriage on Sunday followed by a reception at Wadala, central Mumbai. The bride looked radiant in her red-and-gold zari sari beside her handsome groom in a beige suit. The Sena lost both bypolls held on Saturday, with its Malwan candidate losing his deposit to ex-Sainik Narayan Rane. The marriage is significant because of Thackeray’s past. A saffron supporter, he would denounce Muslims as “Pakade” (Pakistan-backers). In 1999, the Supreme Court barred him from voting in or contesting elections for inciting Hindu-Muslim riots. 2 Responses to "Shiv Sena chief Bal Thackeray’s granddaughter Neha married a Muslim guy "